Luxury Beach Rental * FREE Beach Service * AUG dates still available! Enjoy our luxuriously decorated beach-front condo at Tropic Winds located in the highly sought-after peaceful west-end beaches of Panama City Beach, Florida - home to “The World’s Most Beautiful Beaches”. Our building is the newest high-rise condominium on the beach and offers a quiet get-away from all the crowds, however just 5 minutes from the popular Pier Park entertainment, shopping, and dining district. Tropic Winds is a perfect destination for family vacations, reunions, and romantic getaways with lots of amenities including an indoor/outdoor pool, large jacuzzi hot tub, steam room, dry sauna, fitness room, outdoor grills, and more. Our building is directly on the beach, step right into the soft white sand and surf. Just a short walk along our beautiful beach you’ll find fun water activities, including jet skis, sailboats, and parasailing. Your stay will be unforgettable as you’ll see breathtaking views of the gulf and miles of coastline from our 15th floor unit. Our huge 10 X 28 ft. balcony is an ideal vantage point to routinely spot schools of fish, sting rays, and dolphins. Its also the perfect place to lounge and relax to peaceful sounds of ocean waves and gorgeous sunsets. Our balcony is accessible from both the living area and the ocean-facing master bedroom (many properties on the beach have the master bedroom facing the street). Our smoke free, 2 bedroom / 2 bath vacation home will comfortably accommodate 6 guests. The master suite features a luxurious pillow-top king-size bed and full bathroom with spa shower, direct access to the balcony, and incredible Gulf views. The guest bedroom offers 2 luxurious pillow-top queen-size beds and a full bathroom. Additional sleeping for two is available with our comfortable sleeper sofa w/ memory foam topper. BONUS: Your stay includes complimentary Beach Service ($45.00/day value) from March - October. Enjoy 2 padded lounge chairs with umbrella prepared and serviced just for you everyday on the beach. Reservations for requested dates are on a first-come, first-serve basis. Please view our Availability Calendar and our Rate Schedule prior to making an inquiry. - ABSOLUTELY No Smoking and No Pets! If you’re looking for exciting activities, just a short walk along the beach you’ll find water sport activities, including jet skis, sailboats, and parasailing. - Frank Brown Park - Home to Grand Slam Baseball - Just 2 miles away! - Harley Davidson Motorcycle Complex - Brand new!! - Seaside, Florida - Setting for the Movie, "The Truman Show"
For air travelers, we’re just 11.5 miles from the new Northwest Florida Beaches International Airport (ECP). For more flight options, we're just 53 miles from Fort Walton Regional Airport (VPS), 90 miles from Pensacola International Airport (PNS), and 110 miles from Tallahassee Regional Airport (TLH). It’s hard to imagine a more perfect vacation when you stay at the new Tropic Winds Condominium. Arrival is hassle-free! No wasting time checking in at a front desk. Once you arrive just come on in and you’ll discover you made the perfect vacation choice. We purchased this 2-bedroom condo brand new in 2010. It's our home away from home and we love sharing it with other beach-seeking travelers. We're confident that you'll enjoy our vacation home as much as we do and we're always a phone call or email away if you have any questions or just want to share your experiences. Tropic Winds is located in Panama City Beach, FL - home to the "World's most Beautiful Beach". Our building is the newest high-rise condominium on the beach and offers the largest balcony of any similar property in Panama City Beach. We are the #1 top-rated unit in ALL of Tropic Winds. We receive '5 out-of 5' star ratings consistently and we're always making improvements to make our place stand-out from all the rest. 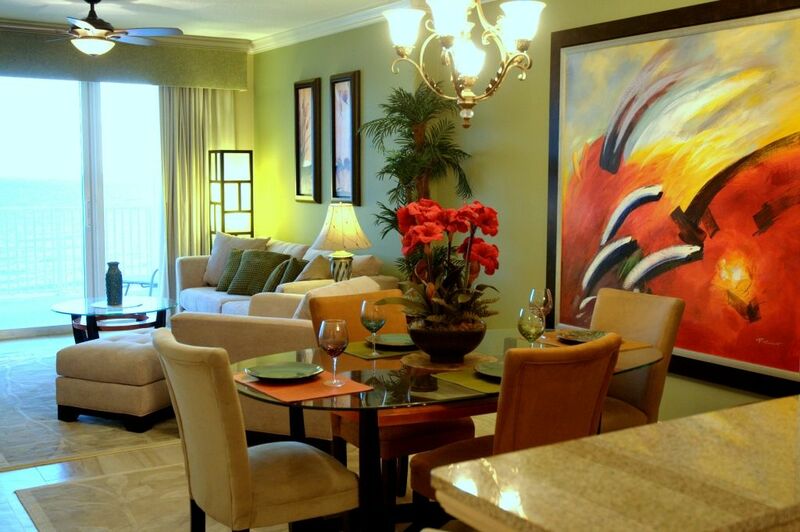 Our property is luxuriously decorated, and offers the largest balcony of any similar property in Panama City Beach. Included with your stay, we include a reserved parking spot (onsite garage). We also include complimentary Beach Service ($45.00/day value) from March - October. Enjoy 2 padded lounge chairs with umbrella prepared and serviced just for you everyday on the beach. Newly remodeled Master Bathroom with spa shower with multi-shower heads and sprayers. Over sized Balcony (10 x 28 ft) with Patio Furniture, Outdoor Table, and chaise lounger; Indoor/outdoor pool, hot tubs, steam room, fitness center, and sauna; Large sun deck area for tanning and relaxation; Beach amenities include over 330’ of beach front property; Free beach service (2 padded lounge chairs with umbrella); Reserved parking space (on site garage); Additional parking available across the street. The condo itself was amazing! We loved the view and the balcony. It was well stocked and had very comfortable beds! The only reason I didn’t give it 6 stars is because the elevators were extremely slow and one almost took my arm off as o was trying to hold it open. Other than that, we loved our stay! We spent 5 months in the unit& all was superb. Gary is a great owner & takes care of any issues immediately. The condo is exceptionally clean & very well appointed. It’s our home away from home for the past 5 years. We look forward to returning this November. Condo 1509 at Tropic Wind was very nice. The owners were great. Tropic Wind is one of our favorite. We really enjoyed 1509. The owners were great especially when he had to handle a problem with our car being towed off. It was just some misunderstanding from another condo owner. I would love to go back and stay in 1509 again. My wife and I vacationed for the first time in PCB August 25 through Sept. 1st, and we will definitely be back. Our past visits have included other beaches along the Emerald Coast, but this was our absolute favorite. SUPER CLEAN AND IMMACULATELY MAINTAINED. As we have read in other reviews of the condo., the pictures do NOT do it justice. It is absolutely BEAUTIFUL from front to back! The master bath has an amazing rain forest shower head, with additional smaller shower head and front jets to provide a great shower experience. Kitchen is stocked with EVERYTHING you might need to cook or entertain. HUGE deck overlooks gulf and has LOTS of seating options that are really comfortable. Daily chair service is included but there are also smaller chairs you can also carry to the beach. The owner (Gary) has thought of everything! He is the best person we have worked with and is a great communicator As for the "neighborhood" we met wonderful people coming and going. This is not a "Spring Break" kind of beach or rental, your will find more quiet enjoyment here. There is no restaurant on site, so do some research on TripAdvisor or ask the locals. You are a short drive from the cool beach towns along highway 30A so that's definitely a plus; visit Grayton Beach for a more laid-back vibe, or Rosemary Beach for a more high-end setting. As for additional fun options immediately available, there was a local company that provided parasail or waverunner options, and you're a short drive from lots of other side trips and activities. We have finally found our "Florida Home" and can't wait until our next stay! This condo is beautiful. The pictures do not do it justice. We enjoyed our stay and would definitely rent this condo again. We absolutely loved this condo and our stay there. I knew from the pictures that the condo looked nice, but the pictures do not do it justice. It is absolutely amazing! The views and balcony are breathtaking, and you can tell that the owner has put a lot of thought and effort in all the details to make your stay even more enjoyable. The spa shower in the master bathroom is wonderful and my kids loved the other room. It was wonderful for them. We are already talking about booking again. Cancellations that are made sixty (60) days or more in advance of the arrival date will incur no penalty and a full refund will be issued. If cancellations, or changes that result in a shortened stay, are requested less than sixty (60) days prior to arrival, the Owner or Authorized Agent will attempt to re-rent the property for the reserved dates, in which case a full refund minus a $25.00 USD administration fee will be issued. Any dates not re-rented will be deducted from the refund. If no dates are re-rented, no refund will be issued.